Stephen Strassburg no longers fits in the Nats rotation. Tanner Roark does. I wrote about trading him last year; it didn’t happen. When the team acquired Scherzer, that was another good time to unload Strass. When Stephen fails twice to back up plays, something we all learn in High School, that’s another sign. But the clearest signs are what we all see with his body-language and his mechanics when he is on the mound. This year Strass looks the “least comfortable” I have ever seen him. The easiest move would be to send him to Syracuse, take the pressure off him and see if he can regain some “will to succeed.” Right now he is a lost soul. Honestly, I think trying to trade him could be difficult. If the Nats are serious about getting to the post-season, this problem needs to be addressed NOW. 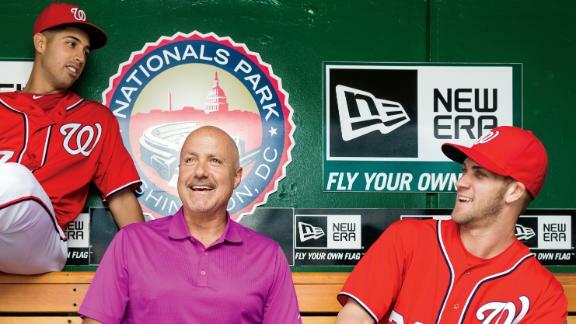 With a bit more time to reflect on this massive coup, I’ll admit that the Nats now have some insurance in case JZimm, Fister or Strassburg is traded. If i were the GM, as I said before, I would make EVERY effort to keep the first two! They also have some insurance (though not on a par with Scherzer) if Ian Desmond walks after this season, having acquired Trea Turner and Yunel Escober who can both at least fill in at SS until a real good option comes along. Honey, I shrunk the team! Well, it turns out Tom Boswell probably didn’t jinx the Nats before the Braves series, the team jinxed itself. One conclusion I drew after the just concluded series is that it seems last year’s dismal results when they played Atlanta left the core Nats who were here last year without much confidence that they can beat the Braves. Conversely, the Braves came to town with a swagger earned from beating the Nats convincingly in 2013 (thirteen times). I’ve seen this happen to teams from time to time. Hopefully the 2-1 Washington win on Sunday will help. But the ugly game on Saturday revealed some serious problems for the team that have me very concerned. I’ll begin with Ryan Zimmerman, the “franchise player.” The face of the team. We all know he has been dealing for years with throwing shoulder problems. Now we know he has a chronic arthritis issue that isn’t going away. He just had all winter to rest the shoulder, so a few days of not playing is no longer the answer. More surgery is not the answer and I’m sure he has tried a variety of drugs. So we are likely looking at a combination of platooning him at first base when a lefty is pitching, Ryan trying to just throw side-arm more of the time(side-arm doesn’t seem to be painfull), and sitting him more often. Ryan’s new $100M multi-year contract complicates the long-range issues, as does the fact that Adam LaRoach is off to a good start this year. Next comes Bryce Harper’s poor start to the season. Many players begin a season “in the slow lane” from time to time. But the way Bryce is dealing with it has me pretty worried. He’s throwing childish temper tantrums and saying he has no clue what the problem is. Most pitchers have figured out how to pitch to Harper and he has not adjusted accordingly. Then I have to point out Stephen Strasburg’s poor performance after Zimmerman’s throwing error. We have all seen him crumble numerous times in the past when faced with adversity; the pouting, the body language, the inability to keep his focus of pitching winning baseball. In Saturday’s game the first two didn’t happen, but the third certainly did! Strasburg’s fastball lost 2-4 mph, he lost enough of his command that he “grooved” a few pitches and the Braves began stringing multiple hits together and I watched his game go downhill. I’m a former pitcher who knows what it takes. To be a successful pitcher requires what I call a Pit Bull mentality. THAT is what Strasburg lacks. I’ll point out two Nats pitchers who clearly have what I’m talking about: Jordan Zimmermann and Tanner Roark (the team has others too) NEVER give in to the other team, no matter what is going on around them. They are both relentless battlers, and the hitters know that. Unless Stephen can somehow develop some mental toughness, he won’t be an elite pitcher. 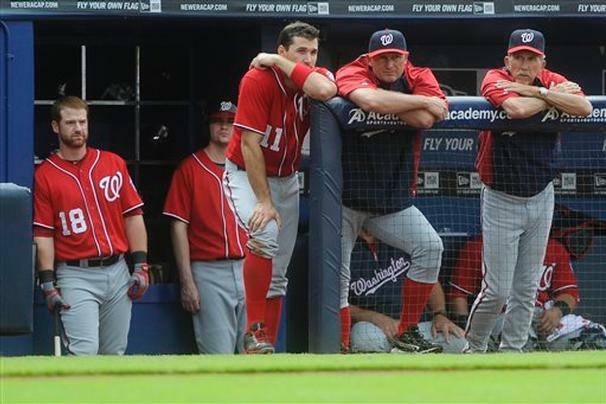 I’m also concerned about Doug Fister‘s and Wilson Ramos‘ injuries. The team needs them sooner rather than later. A. The 5th starter goes to Taylor Jordan. B. The final bullpen slots are Tanner Roark and Aaron Barrett. Barrett replaces Drew Storen, who gets traded. C. The final bench slots are BOTH Moore and Carroll. Hairston gets traded. So the total bench is Espinosa, McLouth, Lobaton, Moore and Carroll. The Nats are at a crossroads right now, faced with the same type of hype that was buffetting them at this time last year. Are they going to “man up” and start the season in line with expectations or with a white knuckle swoon like the one we saw last April. Jayson Werth at bat. Photo courtesy of Alex Brandon/AP. Hope that title catches people’s attention:) I have little use for sports-talk radio or TV; I’m so old I can’t remember what middle school was like, but every time I happen upon one of these programs by mistake the distant memories re-surface, soon to be stuffed back into whatever they escaped from! 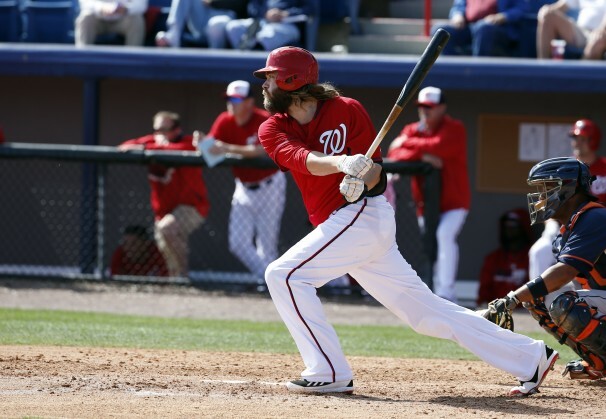 So Jason Werth recently was quoted in the media mentioning what all of us lifer ball-players know all to well: that hitting a baseball is one of the hardest things to do well in all of sports. And Tony just had to open his foolish mouth and call Werth “an idiot!” Enough said. On to the more important things. There are but 3 decisions left for Matt Williams regarding the final 25-man starting roster: one utility bench-man, the 7th relief pitcher and the 5th starting pitcher. 1. It’s between Jamey Carroll or Tyler Moore. Moore’s been hitting better, but Carroll brings many skills he does well. Carroll gets my vote. And if that is what happens, then I think Moore gets traded (to Houston). 2. Number 2 depends on what the decision is for number 3. If Tanner Roark is the 5th starter (assuming Doug Fister is really set to go), then Aaron Barrett is the 7th and final guy in the bullpen. And that is how I think this will play out. 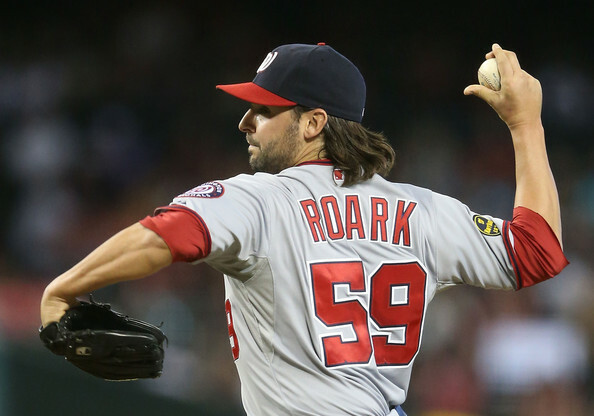 But, if Roark does not get a starting pitcher slot, he goes to the bullpen, and jordan would be the likely 5th starter. A lot of Gnats fans are wondering how the competition to fill the fifth starting pitcher slot is likely to be resolved. Well, here is my humble opinion. And I’ll preface it (as an experienced gamer) by saying such competition is very healthy and the Nats are extremely lucky to have so much talent in Spring Training Camp! Ross “Det” Detwiler: I think this is his to lose, and I say this for several reasons. First, he has the most quality major league experience. Second, he is out of options (he can’t be sent back to the minor leagues–there is a rule limiting the number of times a player can be sent down to the minor leagues). Third, he was VERY EFFECTIVE early last season, until he got injured. Tanner Roark: Many will argue he should get the nod, as he was arguably the Nats best pitcher over the last 6 weeks of the season last Fall. I too was impressed with his success last year. And this will likely mean that if Det is the fifth starter, Tanner Roark will be the “long man” in the bullpen. So the team wins either way! Taylor Jordan: With the least amount of major league experience, unless Jordan really lights up the scene in Florida, the best thing for his development would be to start the season with the Nats’ AAA team in Syracuse , pitch a lot and be ready if someone gets hurt on the parent team. This is a talented kid with beaucoup upside potential who may actually be ready for THE SHOW if the team had a space! On to the “Danny Watch.” Whoopee, he got his first hit yesterday. It’s only Spring Training, and the new manager has to give Danny Espinosa a chance, but I think the hand-writing is out there. After 2+ seasons in the bigs, Danny just cannot hit big-league pitching. 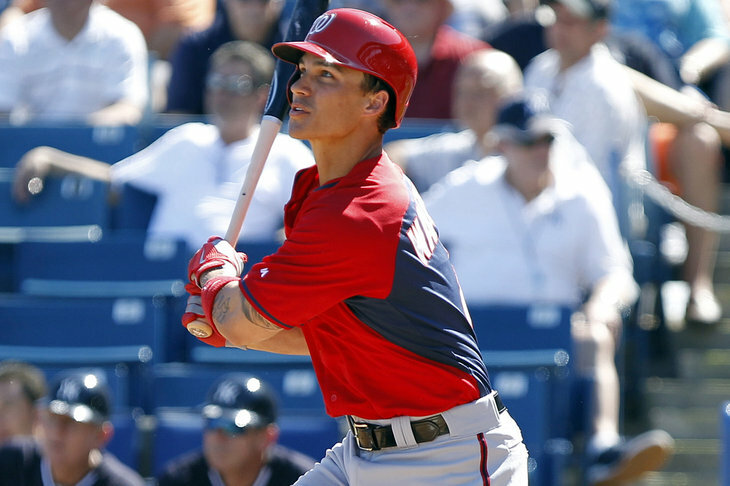 Meanwhile, among the infielders in camp, Zach Walters can, Anthony Rendon and Jamey Carroll can, and some of the other “kids” are looking good too. I recommend Mike Rizzo call Bo Porter (Houston manager and former Nats’ third-base coach) and work something out to ship Danny to Houston. They need lots of new blood in Houston! Thank goodness! I’d been hearing rumors for about a week now that the Washington Nationals (Nats) were talking with pitcher A.J. Burnett about coming to the Nats to be in the starting rotation. Though I know A.J. is a very good pitcher (gritty, tough, lots of “heart”, etc), I was hoping it would not happen. Well, today the MLB XM radio station reported he has signed with the Phillies, so I can exhale! I’m happy for Philadelphia, they need him and he can help them a lot. A.J. pitched for the Pirates in 2012 and played a key role in helping them make the playoffs. I watched him pitch several times and he really had everything working! I have no idea why he did not stay with Pittsburg, but he made it clear he only wanted to play for a team as close to Pennsylvania as possible, and he preferred to play in the National League. That meant he didn’t want to play for Baltimore.